New Tool Makes it Easy to Find Prospects on Social Networks via Social Appending. Appending is the practice of adding contact information to records in your prospect database. If you have someone’s name and company, you could “append” their email address and mailing address through a number of services that keep that kind of information. Companies that sell mailing lists often provide this kind of service. The thinking was that the prospect hadn’t given you permission to contact them through these other channels, and that it violated the “submit button contract” that is implied when they completed an online form. Social Appending: How Far We Have Come. 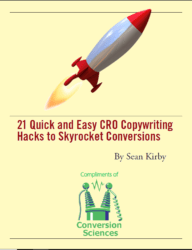 Source: Unbounce. Oli Gardner has an interesting info graphic on the Unbounce blog. The graphic highlights a tool called FlowTown. This is a social appending tool. Marketers can use it to find the social media accounts of their prospect list, and begin marketing to them through those social media channels like Facebook and LinkedIn. This is where those of us who have been around the block groan, and then secretly cheer. While appending has not been considered a best practice, it happens. In fact, the best way to do this is to send ask your prospects for permission after appending the data; sending them an email asking if they want email messages, for example. Many social media platforms allow us to easily “unfriend” or block unsavory marketers. This puts the opt-out capability in our hands. So asking for permission ahead of time is less of a problem. But there is a right way to inject yourself into someone else’s conversations. It’s called a Content-oriented Social Media Strategy. Only “append” people who have expressed an interest in your industry or products. This is how you know your content will be relevant. Begin with non-promotional content. “How-to” and “10 Ways” style articles test well. Measure what you send. Stop sending content that doesn’t generate clicks, shares or comments. If you’re going to jump into the social conversations, do it right, or it will backfire in a very public, viral way. Dave Evans is one of the smartest guys in Social Media today and has the ability to ask questions that make you stop and think. Really think. So, when he asked my opinion on where social media meets conversion strategy, I really had to think. The result of our collaboration is his latest ClickZ article Social Conversions: Taking Step Two. For me, the process crystallized the reasons that so many of us have trouble seeing the ROI in social marketing. We’re looking at it wrong. I will expand here on how we use inappropriate strategies for our social marketing campaigns. In subsequent posts, I’ll drill down on some of the strategies mentioned in the column and show you how they work. Dave’s article hints at the way we use old measures of success in new paradigms. We see social media as simply another way to drive traffic to our traditional conversion funnels. 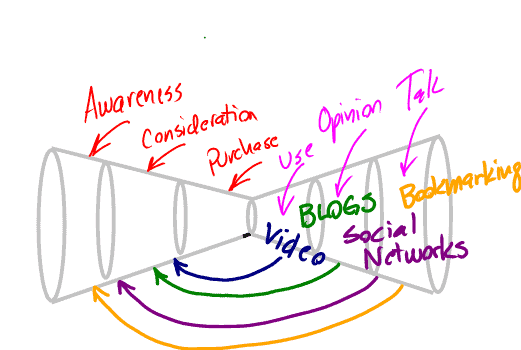 With this model, we try to cram our social strategies into the Awareness portion of the marketing funnel. While this is a valid use of social marketing, it is it’s most limited. When we realize that there is a whole world of conversion after the purchase we begin to use our social marketing more strategically. This expanded model for social media let’s us use social channels more strategically. Can you see how we would apply social marketing in a more purposeful way when we change our point of view? Doesn’t it become clearer how we would measure the success of our social campaigns beyond just traffic and page views? If you answered “Well, kinda,” don’t worry. Designing a blog that converts buyers to users, users to opinion, and opinion to talk. For a complete understanding of the marketing funnel, read Dave’s book Social Media Marketing: An Hour a Day.